PRO Martial Arts is about far more than kicking, punching and karate workouts. 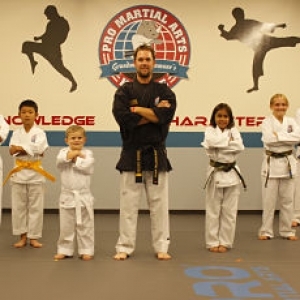 From kids to adults, from beginners to experts, from karate, to kickboxing - every class at PRO Martial Arts includes a core focus on building confidence, staying safe, and developing character. PRO Martial Arts offers a cohesive blend of the best elements of traditional Korean martial arts. PMA provides the opportunity to develop a potent blend of strength, flexibility, coordination, and balance, while learning effective and proven self-defense techniques in a fun and energizing environment. But what truly sets PRO Martial Arts apart from the average martial arts school are our inspiring and motivational life skills training programs for students ages 4 to 17. Our proprietary programs, including ARMOR-Bullying and Predator Prevention, Little Rhinos for preschoolers, Character Education, and Advanced Leadership, set us apart from the average martial arts school.